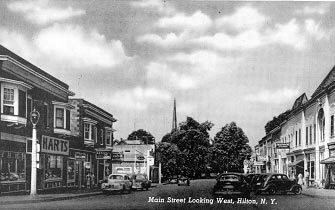 The Hilton Hotel was on the Conner of Main St. and South Ave. 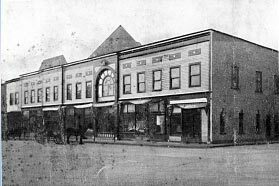 This picture shows the building with 3 stories. After it burned the first time it lost the top floor. The hotel burned at least 3 times. 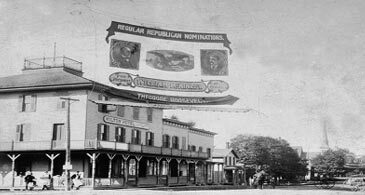 The sign hanging at the top of this picture shows the Republican candidates for president of the United States. 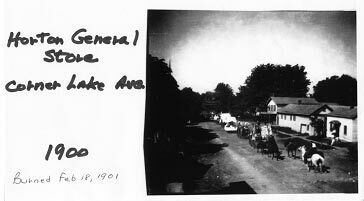 The Horton General Store's location is now the Home Movie store on the Corner of Main St..and South Ave. It burned in 1901. 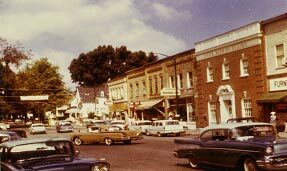 The buildings on the left are still there. 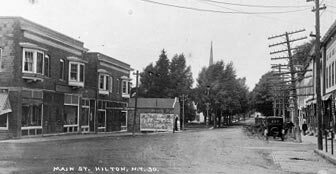 We dated this picture by the cars, paved roads and lack of power lines. This was prior to World War II. 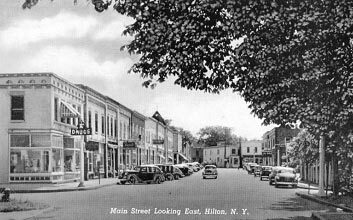 The telephone office is upstairs with the Hilton Records (above the drug store). 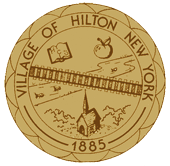 The Hilton Records was once a newspaper publisher. 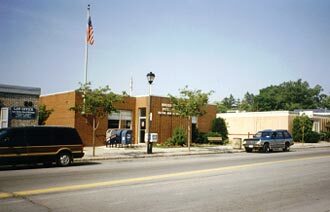 In 1965 the bank was burned even though it was made of brick. It was burned because of a wooden beam connecting the buildings together. The buildings you see here replace the buildings that burned in the 1965 fire. The United Methodist church is next to the Library. 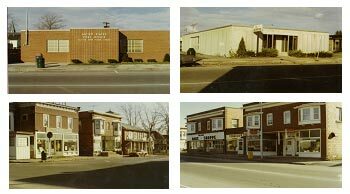 These are pictures before and after the 1981 fire. 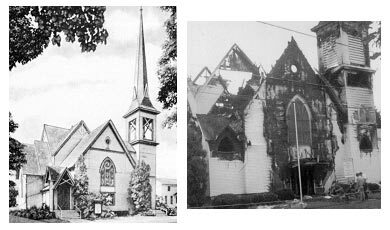 The firemen were able to save the stained glass windows so the church still has the original windows. The four 2-story buildings are the only ones remaining from the 1965 fire.